2018 Update: Revolutionary City (RC) is gone. And yet it lives. Let me explain. Revolution City used to be a special street theater program at Colonial Williamsburg which featured two-hour productions featuring actors in authentic costumes acting out real events from the revolutionary era. The productions took place along the Duke of Gloucester Street. They even had a morning program, “Revolutionary Stories,” which featured mini-programs based on fact (like colonial love stories) which were designed to whet visitors’ appetites so that they’d stay for the main shows in the afternoon. Collapse of the Royal Government - The event started off with "The Next Disagreeable Thing," a re-enactment of a loud argument over the 1765 Stamp Act which took place at the newly-recreated Charlton's Coffeehouse. To attend these programs, you had to have a Colonial Williamsburg admission ticket. My guess is that it was a victim of cost-cutting and a general rising lack of interest in history (plus too many people glued to their phones, I'd add). So is Revolutionary City Dead? The Revolutionary City programs are indeed gone, although your admission to Colonial Williamsburg (here are the latest facts on how to get tickets for less) will still expose you to dozens of interpreters both in costume and in character who can be seen in the shops and historical buildings throughout the Historic Area. Instead, Colonial Williamsburg appears to have adopted the term "Revolutionary City" as a nickname for itself, since it is indeed the original, authentic place where you can experience the ins and outs of the American Revolution first hand. Speaking of cost cutting, one thing is still true: if you DO want to see parts of Colonial Williamsburg without paying admission, here's how. 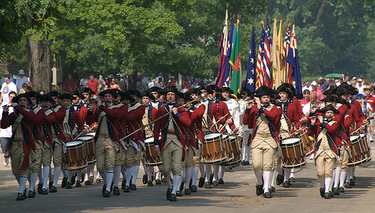 To get the best deal on Historic Area tickets, visit my Colonial Williamsburg admission page. And for more about the Historic Area itself, call 1-800-HISTORY or go to their website: www.history.org.